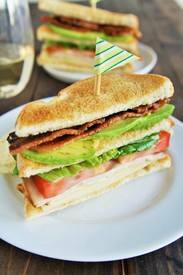 These Club Sandwiches are stacked high with candied Bacon and avocado – perfect for a party snack! Don’t you love it when you re-discover an old favorite? I used to make club sandwiches often and they sort of got lost in my recipe shuffle. Although avocado is not typical in a club sandwich, I had some perfectly ripe avocados the other day and I didn’t want it to go to waste so I thought I would add it to my club sandwich. Plus, I made another modification with Bacon, and not just any Bacon. These are the ultimate candied Bacon for you lovers of sweet and savory combination!